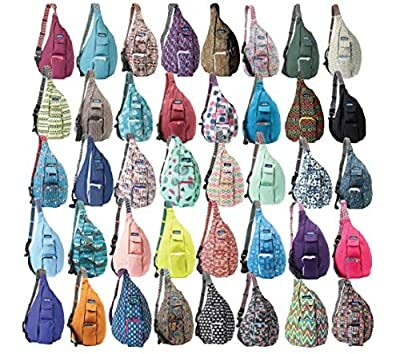 KAVU's Rope Bag is the most stylish way to store your daily carry. The teardrop shape and signature rope straps are super unique and ergonomically designed to fit snugly to your body. Two vertical zip compartments offer plenty of space for books, bottles, or cameras and a single interior zipper pocket, which is great for keys or any other secret goodies. The outside of the bag is fitted with zipper and velcro pouches, for quick access to smaller gear like smartphones, charger cables, or makeup. The Rope bag is designed to help your adventure run more smoothly. From keeping you organized while you rush to class or gearing up for some off-the-grid exploring in Port Renfrew, BC - with your KAVU Rope Bag, Fun Has No Season! KAVU offers custom patterns for the Rope Bag, that range from classic Black to chill Pineapple Passion to explosive Sparklers. These funky styles are designed by our awesome team in Seattle, WA and are exclusive to this season. That means that once they are sold out, they will not be reprinted, so don't miss out on the awesome new styles from KAVU!